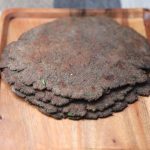 What is Kuttu Paratha ? 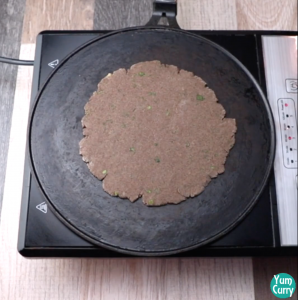 Kuttu paratha is made from Kuttu flour, which is also known as buckwheat flour. Dishes made by kuttu or buckwheat flour varies across india – some famous recipe made by kuttu flour such as Kuttu Poori, kuttu pakora, kuttu dosa are famous among Indians to consume during fasting. 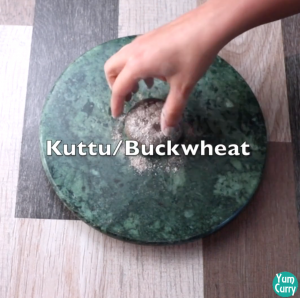 Kuttu (buckwheat) is a super food with uncountable benefits, but it is nowhere related to wheat. It’s a grain like seeds, grown in northern parts of India. It is packed with nutrition, minerals, Iron, magnesium, fibre, protein, antioxidant and amino acids. The importance of fasting during Navaratri is to seek the blessings of Goddess Durga. During navratri, devotees does fasting and worship goddess Durga and her nine avatar to show our gratitude to the Goddess. In today’s world, we tend to be lured by fancy diets with pompous decoration , however we should try to follow what our ancestors have given us and one of the religious ritual is Navratri fasting, which purify our mind and body. As we know during Navratri, eating grains, cereals and tamsik food is avoided and same is proven in ayurveda that tamsik food is harmful for our body so the sole purpose of navratri and other fasting is to detoxify and purify body and soul. Proper balanced diet is important if you are fasting for 9 days, include lots of water and fruits to your diet, without which detoxification is not possible. some flours are allowed to have during fast like buckwheat flour(Kuttu aata), water chestnut flour(singhara aata) and amaranth flour(rajgir aata), since these are extremely healthy option to replace wheat flour, but if you end up eating frying items like pooris, potato and high sugar food, it will harm your body. Kuttu flour help in weight loss as it has less calories than wheat flour. If used regularly then it can reduce the chances of Asthama by 50%. It also help to reduce the cholesterol level. Kuttu flour is high in vitamin E and magnesium that help to make healthy bones. Kuttu flour is gluten free. 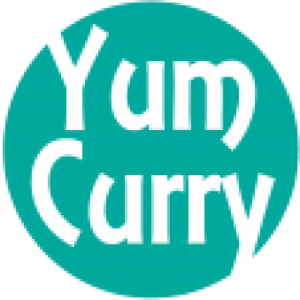 it is good alternative for people who is have gluten intolerance. It also contains complex carbohydrates which aids in hair growth. 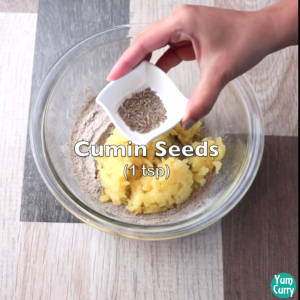 I have also made some more recipes for vrat or fast specially for Navratri in my navratri recipe collection which includes recipes such as coconut barfi, khajur barfi, milk peda for dessert. And singhara pakora, falahari chaat, sabudana khichadi and sabudana vada for savoury food. Kuttu is consumed during fast, it is consumed in India since ancient times and the main reason behind having kuttu during fast is, it is packed with nutrition and provide you instant energy. So after reading all its benefit during preparation of recipe , I will be adding this power packed food to my regular cooking specially during winters. 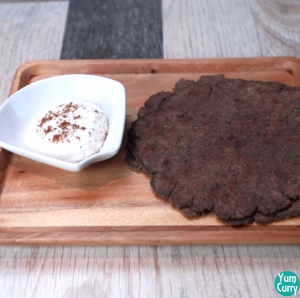 Enjoy this kuttu paratha with curd, potato curry or chutney. 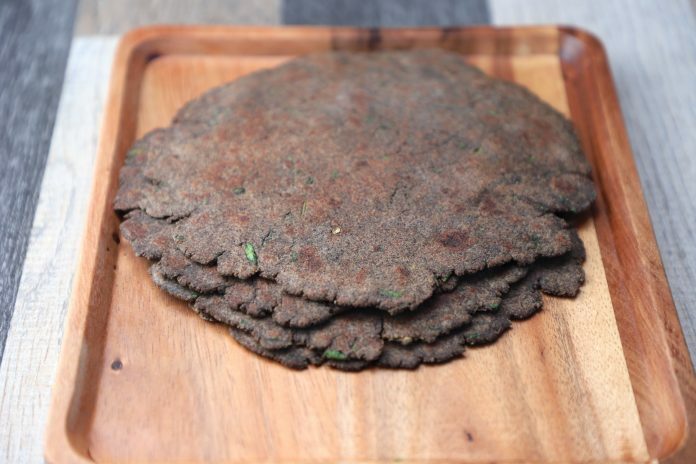 If you are allergic to Kuttu(buckwheat), replace kuttu flour with rajgir flour or singhara flour. Always use fresh kuttu aata (buckwheat flour), because kuttu flour has very less shelf life in comparison to other flours. In making Kuttu Paratha quantity of potatoes is very important in rolling it easily, if you add less potato it will be difficult to roll. 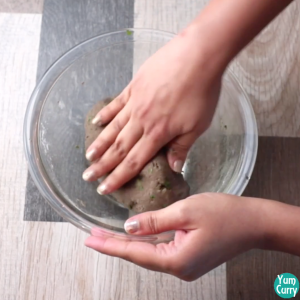 You can use arabi instead potato to make it healthier. If dough is sticky, you can place plastic to roll it easily. 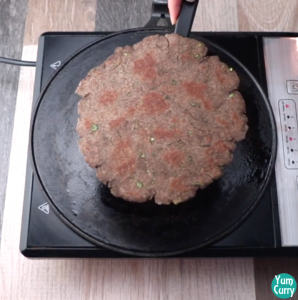 Kuttu is one of the best replacement of wheat flour if you have gluten intolerance. kuttu should not be consumed very frequently or regularly because it is very warm in nature, over eating can be harmful. It is good to use it during winter. 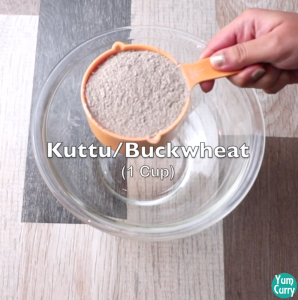 Take 1 cup of Kuttu flour(buckwheat). Add boiled and mashed potatoes to it. 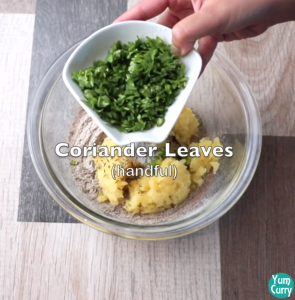 Add 1 tsp jeera or cumin seeds, 1 green chilli, rock salt as per taste and a small bunch of coriander leaves to it. 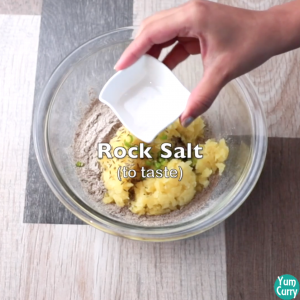 Mix all ingredient very well and start kneading dough. Add little water at time. Knead a little stiff dough. Cover the dough and leave it for 10 mins. 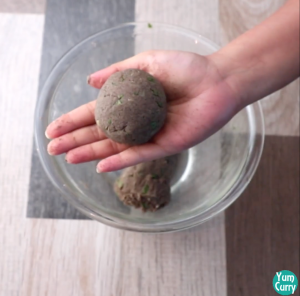 Divide dough into 5 or 6 equal portions and make balls out of it. 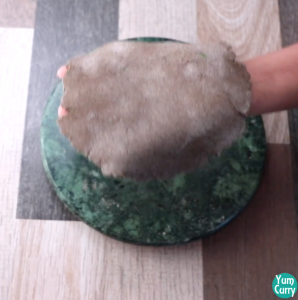 Now take one portion, dust with some kuttu flour and stretch it by using finger. Start rolling by using rolling pin, don't roll it very thin, if dough is sticky you can place plastic bag and roll by keeping dough between two layers of plastic. Carefully lift it and place to hot tawa, let it cook for some time. Flip it and apply some oil, again flip it and apply oil to the other side. gently press on the edges so it can cook well from all sides. Boil 2 medium size Potatoes. 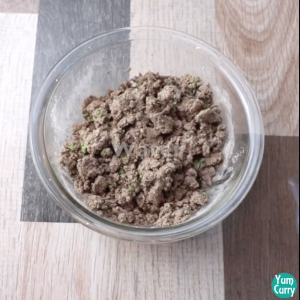 Take a bowl and add 1 cup Kuttu(Buckwheat) flour and 2 boiled – mashed Potatoes to it. 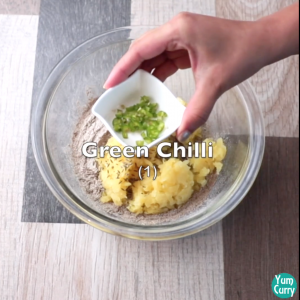 Now add all other ingredient Cumin, green chillies, coriander and rock salt to it. Mix all the ingredient well. 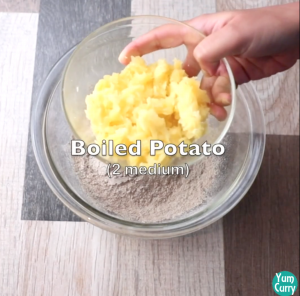 Because of potato all the ingredients comes together easily. 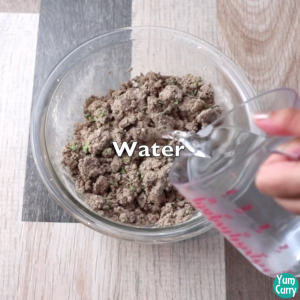 Now start kneading the dough, add little water at a time. Don’t add too much water else it will be difficult to roll while making paratha. Dough should be little stiff. Divide dough into 5 or 6 equal portions and make round balls out of it. 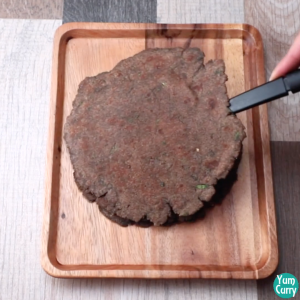 Take one portion, dust some kuttu flour and try to stretch it using your fingers. Now start rolling it by using rolling pin, do not roll it very thin. 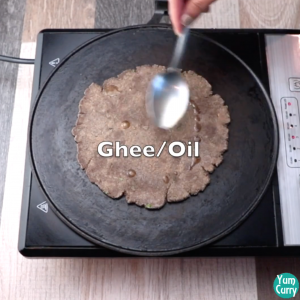 Place on hot tawa, cook it from one side and flip, now apply some oil or ghee to it. 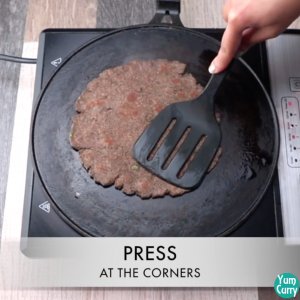 Again flip it to apply oil on other side, press gently on the edges so it can cook perfectly from all sides. 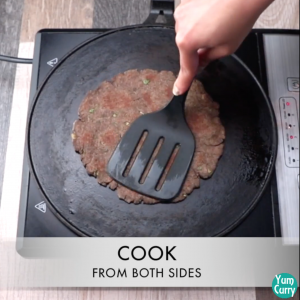 Serve this tasty and healthy paratha with curd, potato curry or chutney.